Two small, grey moths in one week! This one is the Small Engrailed Moth, Ectropis crepuscularia. It's very similar to the Half-wing Moth featured earlier on this blog. They are both active in colder weather and have caterpillars that feed on a wide variety of plants. 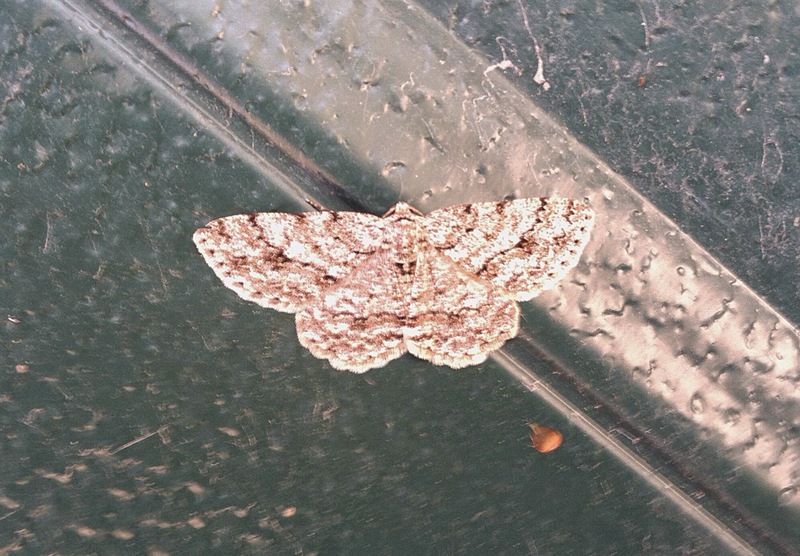 Small Engrailed Moth is quite a name for such a small animal, plus, of course, it gets its own scientific name. What does it all mean? "Engrailed" is a term from heraldry that indicates a scalloped line. Maybe the engrailed in this moth's name refers to the pattern along the wing edges. The species name crepuscularia must refer to the word crepuscular, which describes animals that are active at dawn and dusk. The genus name Ectropis is hard for me to decipher, though it has some familiar sounded components (which are derived from Greek): "ec" means outside or out from "trop" means attracted to, and "is" means a result of action, condition, or doctrine. But what's the meaning when they are all put together?